With everything going on of late, I have been making quick and easy recipes that are practical, healthy and above all tasty. Whenever I am busy, I always have a tendency to reach for junk food. Its quick and easy but it never really satisfies in the long run. 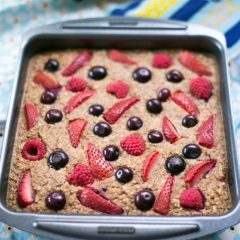 Not like this Healthy Baked Mixed Berry Oatmeal, which is so easy to make, satisfying and tasty. 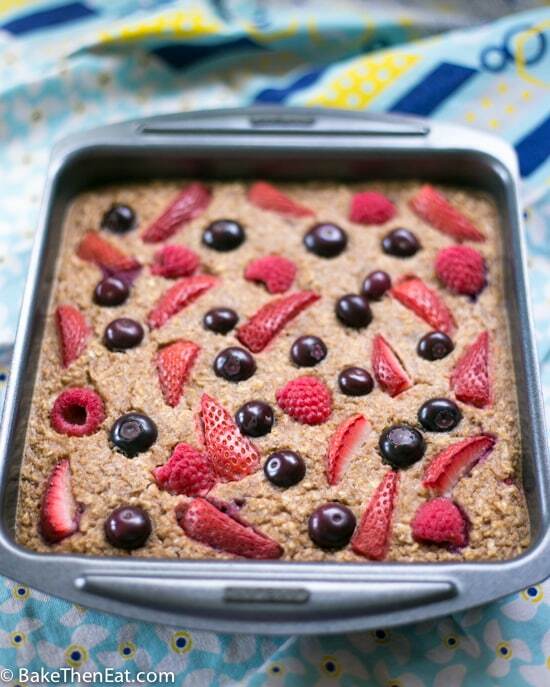 This healthy baked mixed berry oatmeal makes a great weekend breakfast. A brilliant grab and go breakfast and actually quite a nice healthy dessert. 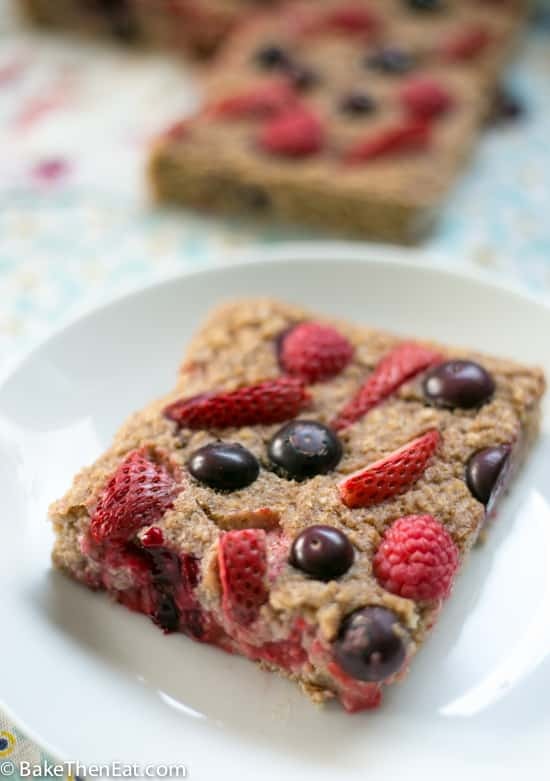 This healthy baked mixed berry oatmeal works great for breakfast, dessert or as a healthy snack. Packed full of oats and fruit this dish is hearty enough to satisfy your hunger and any sweet craving you may have. I have enjoyed it warmed up for breakfast, cold as a mid-afternoon snack and served with some Greek yoghurt for dessert. There is very little added in the way of sweeteners. 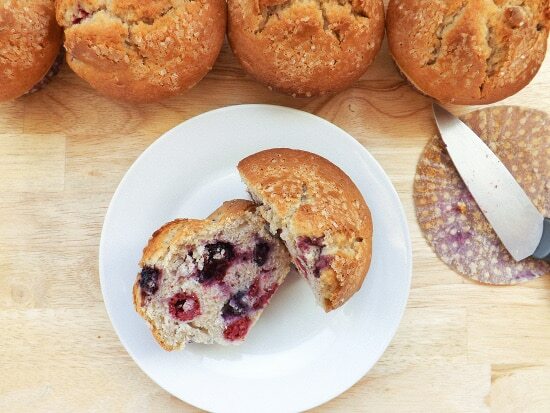 There are 2 tablespoons of light agave nectar and 3 teaspoons of Truvia sweetener added. You can replace this with sugar if you wish to, or any granulated sweetener of your choice. I like Truvia because at least it is natural and not artificial, and has zero calories! Which is always a bonus. There is also a mashed banana mixed in with all the oats, it is best to use a ripe banana as it will impart more sweetness. The more brown spots the better, also ripe juicy berries are packed full of natural sweetness. I used a combination of strawberries, raspberries and blueberries. 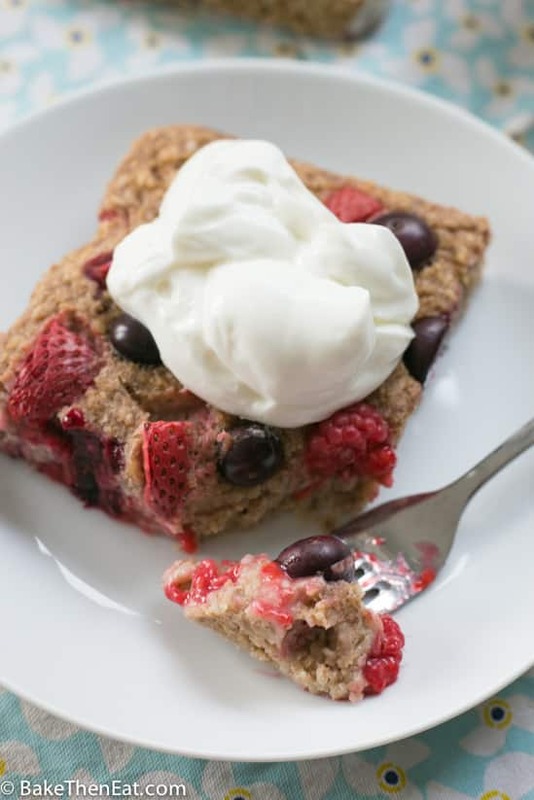 Obviously, there are oats but there are a few other things which help to give this healthy baked mixed berry oatmeal its lovely flavour and texture. Along with the mashed banana and agave nectar we have unsweetened almond milk. Any milk of choice will work, an egg and some vanilla extract. Dry ingredients are cinnamon, a pinch of salt, a small amount of Truvia and a touch of baking powder, to help give it a small lift. 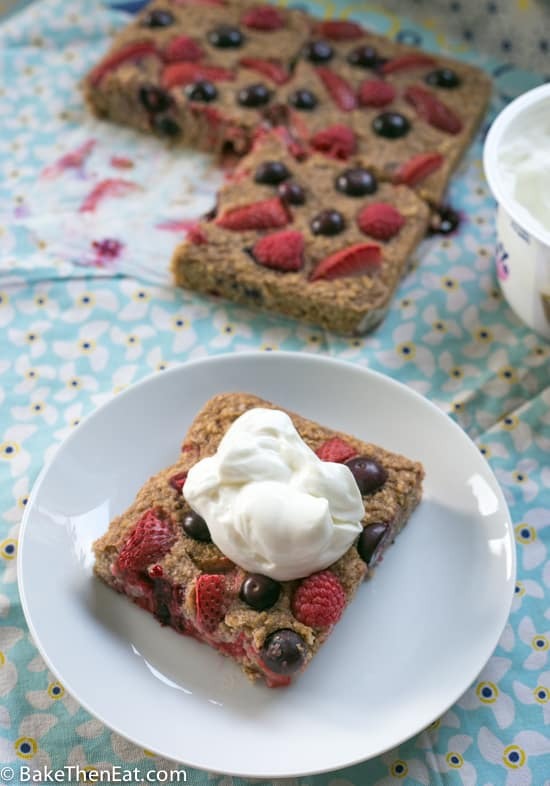 Healthy Baked Mixed Berry Oatmeal can be enjoyed for breakfast, dessert or as a healthy snack and perfect when served with Greek yoghurt. Packed full of oats and berries. Preheat your oven to 170C/325F/Gas mark 3 and line the bottom of a square 8x8 inch tin with baking parchment. Scatter half of your fruit over the bottom of the tin and place to one side. In a medium-sized mixing bowl, add in the oats, cinnamon, baking powder, salt and granulated sweetener. Mix it all together. In a large jug add in the milk, egg, vanilla extract, agave nectar and mashed banana and mix until you have a smooth batter. Pour the liquid ingredients over the oats and mix everything together until everything is well combined. Pour the batter over your fruit and then scatter the remaining fruit over the top and pop your tin in the oven and bake for 25 minutes. You are looking for your for your baked oatmeal to have turned a lovely golden colour and be springy to the touch. This baked oatmeal is best kept in the fridge and eaten within 3 days. Do you know of anything I could substitute the banana with ? This looks delicious but bananas bother both myself and my fiancé. Hi Judy, I have only just found your comment in the spam folder so I apologise for taking so long to reply to you. I haven’t tried it, but you could try substituting with applesauce. It has a similar consistency and it shouldn’t change the flavour profile too much. It looks GREAT and perfect for any time of the day, Emma. Nice that you can have it for breakfast & dessert or just like that in-between meals. Great recipe! Have a nice weekend! 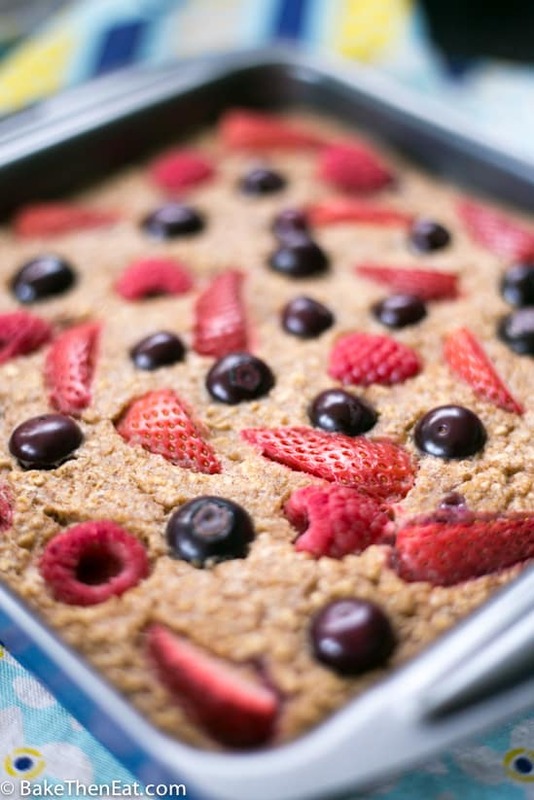 i eat oatmeal nearly every day for breakfast but it’s never baked–must try! Its a great way to enjoy oatmeal if you are in a bit of a rush and you have a slice or two in the fridge! 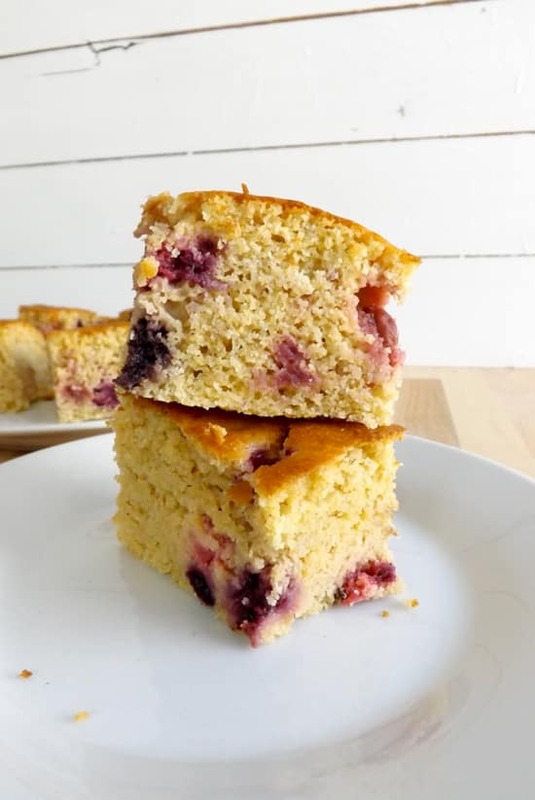 My hubby is the oatmeal eater in this house, but I think this baked version with all the gorgeous berries looks amazing! I’d definitely eat it, too! Thanks, Liz. It’s definitely a great way to eat oatmeal if you are not a huge fan. Mmmm, this looks SO GOOD! Love fun, healthy, and TASTY dishes like this. Thanks! same to making quick and healthy things recently! ignoring the chocolate chip cookies last week (; this week is all sauteed kale and eggs though, in prep for what i’m sure is to be a weekend of gluttony! The only reason I eat healthy is so I can binge on nights out and enjoy the weekends!!! This is beautiful! I love the fresh fruit on it! No but seriously – ANY EXCUSE to eat dessert for breakfast. YES PLEASE! Did your partner make a scene over this beauty because if so, I would make him sleep outside tonight LOL!